Makhan Shah trader from Jhelum district was carrying a ship of his goods and got caught up in a furious storm. His life and goods were in great danger. Helplessly, he knelt down and prayed to God and Guru Nanak for safety. He vowed that if by the grace of Guru he landed at the nearest port safely, he would donate five hundred Dinars to the Guru for charitable purposes. As good luck would have it, his ship steered safely of the wild storm. He felt that his life and goods were saved by the grace of the Guru. The first thing he did was to fulfill his vow. But on reaching Baba Bakala he found several impostors, each posing as Guru. He decided to offer only two Dinars to every one posing to be Guru Harkrishan's successor. The true Guru would himself demand the exact amount he had vowed to give. As expected, none of the imposters could recognize him. But he was left with a problem; if none of these men were the Guru then where is the rightful Guru? Then he heard of a solitarian in the area. His name was Tegh Bahadur and he was the son of Guru Hargobind. Well, Makhan Shah went to see this man, and when he placed two dinars before Tegh Bahadur, the great sage at once remarked "God bless you, my man, why only two Dinars after pledging five hundred? 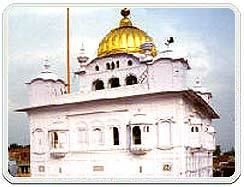 The Guru is never in need of any thing but a Sikh is expected to keep his pledge to the Guru." Thus the issue was clinched and the real Guru was discovered by Makhan Shah. In amazement Makhan Shah proclaimed that he would inform everyone upon discovering the True Guru. Guru Tegh Bahadur Ji was hoping to continue to meditate in solitude and told Makhan Shah not to tell anyone. The Guru tried to discourage him by saying his face would be blackened if he did so(this is a statement meaning you will be dishonored). Makhan Shah took this as a challenge instead of a curse and put ash on his face and climbed to the rooftop to announce to all that he had found the Guru. Since this historic event Bakala has become a place of pilgrimage. A beautiful Gurdwara stands at the spot where Guru Ji used to meditate in an underground cell. 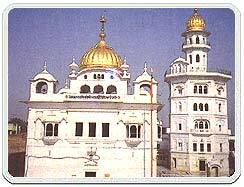 This small village where Guru Ji revealed himself subsequently, came to be called Baba �Bakala. The Gurdwara has many beautiful paintings pertaining to the Sikh history. People gather in thousands on every amavas night.